Plan your next party or gathering around creating beauty. Making mosaics is a great group activity. Whether you are celebrating something special or simply getting a group of friends together we can help you design a creative and rewarding experience in our colorful studio space or on the go. During our open hours groups up to 6 persons may reserve our classroom for a private group experience. Each person may make their own mosaic, or the group may all work on parts of a whole. Prices start at $45/person and vary based on size of mosaic. Contact us to arrange and reserve our classroom. The simple method we use to create mosaics makes it very easy for a large group of people to work on pieces of a whole mosaic. Your group can work on one large project, such as a mirror or sign or, alternatively, each person in the group can work on their own individual mosaic. After a consultation meeting with you where we get a good understanding of what you want your party to feel like, we’ll create a custom, hands-on experience for your group.Designed to be fun and rewarding, your mosaic adventure will result in a beautiful artwork you can be proud of. 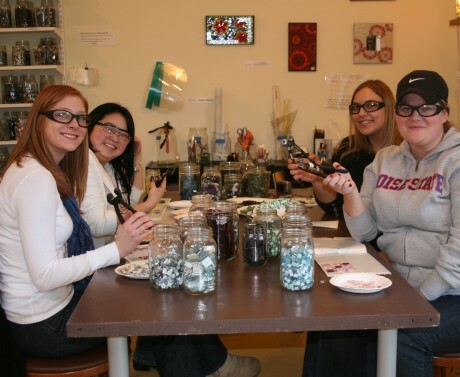 No mosaic or art background is necessary—we provide all the instruction and materials needed. Enjoy our gorgeous color and music filled studio all to yourselves. The studio is generally available for private events on Tuesdays and Thursdays (daytime or evening hours) as well as Saturday and Sunday evenings. Rental includes staff and space for up to 12 people. *If you have more than 12 people, we can likely accommodate you. Additional SMA staff may be required for an extra fee. You are welcome to bring food and beverages. Pricing is based on Studio Rental Fees (starting at $250/half day or evening) plus the cost of your mosaics. The cost per mosaic varies depending on size and item. All materials and instruction required for mosaic, as well as mosaic set up and finishing work (cementing and grouting) is included. On the Go – Host a party at home, office, park or wherever the muse lives! We will supply all the necessary materials, nippers, instruction and setups for you to easily create mosaics in a group wherever you would like to be. Pick one big project to work on or choose a variety of our different projects to make as individuals. Bring your designed mosaics back to us and we will do the messy parts and you get to pick up your gorgeous mosaics. Bring the mosaic party to your home, office, school or even to a park. Our method is easy to make portable. After meeting with you to discuss what type of mosaics you want to make, we create a complete kit for you. We offer many creative ways to incorporate a mosaic activity into a gathering. For example, at a wedding shower, reception or retirement party, set the project out on a table. Guests may stop by the table to add to the design throughout the event, helping to create a beautiful lasting mosaic. Schedule a consultation visit and let us help you plan your next event. Contact us to arrange or for any questions.